This product is an upgrade: Revoice Pro 4 - Upgrade from Revoice Pro 3. Since its initial launch in 2012, Revoice Pro has become a staple for timing and pitch adjustment for vocals, dialog and instruments for audio engineers in both the music and post production industries. Its users do not only appreciate the time they save on editing tasks, but also the program’s ability to retain the natural sound and feel of the original recording, even while performing significant adjustments to the audio. Revoice Pro 4 has over 70 new features and improvements over the previous version. These include much improved handling of musical vibrato, the new APT Music and Dialog modes, numerous graphic and workflow improvements, ARA 2 support and cloud based licensing. 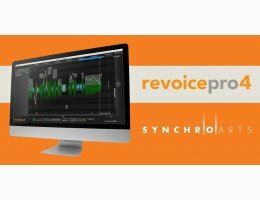 Revoice Pro’s unique Audio Performance Transfer (APT) function can clone the timing, pitch and level of one audio track and apply it to another (or several others)—perfect for tightening up multi-layered vocal tracks, and for dialog replacement in film. Revoice Pro also offers comprehensive manual adjustment of timing, pitch and vibrato, a de-esser and a fantastic sounding doubler. Revoice Pro 4 raises the bar further with its new features and improvements. Highlights include the new Vibrato Warp function, which intelligently identifies the singer’s vibrato characteristics, and retains them—even when time stretching or compressing their voice. With other time-modifying applications, the vibrato speeds up or down when the length of a part is altered. The unique Audio Performance Transfer has been further refined, and users can choose between APT Music and Dialog modes depending on the task at hand, for even better results when aligning the pitch, time or level of one track to another. Numerous graphic and workflow improvements, such as user-definable key commands, have also been implemented. Revoice Pro is now ARA 2 compatible, which means significantly improved integration with ARA 2-ready DAWs. And last but not least, Revoice Pro 4 users now have the choice to use iLok Cloud based licensing for authorization, meaning there’s no need for an iLok USB Key to run or try the application. The tightness of the transferred feature can be controlled to allow natural acceptable differences to pass through unchanged. Optional user-inserted Protected Regions allow selected sections of the Dub signals to be left unchanged in timing or pitch by the APT process. The automatic APT processing can be followed by (or replaced by) manual editing of the output features. APT Pitch (and other feature's) processing settings can be made time-varying (automated). Process-based solo switching, via single keys, provides instant audition to compare inputs and outputs one or two signals at a time. The effects of any changes made to APT control panel parameters will be immediately visible (after rendering) in the displayed output graphics of pitch, level and waveform traces. Multiple Dub signals can use the same Guide and be efficiently processed at the same time. A comprehensive Preset system allows saving and reusing settings. Revoice Pro version 4 is now ARA 2 compatible. iLok Cloud based licensing for authorization now supported. Revoice Pro version 4 has a new Vibrato Warp function, which intelligently identifies the singer’s vibrato characteristics.